Aromex tablets (Generic Aromasin) containing Exemestane act as steroidal inhibitors of the enzyme aromatase, which controls the conversion of testosterone to esterone (E1) and androstenedione to estradiol (E2). This type of inhibition by Exemestane obstructs the synthesis of estrogen hormone in postmenopausal women who are diagnosed with breast cancer. Exemestane tablets (Aromex) are prescribed as oral therapy for breast tumors which are dependent on estrogen for their growth and survival in the body and in tumors where treatment with other anti-cancer drugs such as tamoxifen for two-three years has failed. Since Generic Aromasin tablets act as anti-estrogens, bodybuilders also use this medication to restore the natural level of testosterone in the body, so that they can avoid the undesirable effects of estrogen such as gynecomastia that rise at the end of a steroid cycle. In our online pharmacy, Aromex tablets are available in the strength of 25 mg of Exemestane. We also have in stock Altamofen 10 mg and 20 mg which is also used to treat the same indications. Aromex tablets. They are also known as Generic Aromasin or Generic Exemestane. The active pharmaceutical ingredient in Aromex tablets is Exemestane. 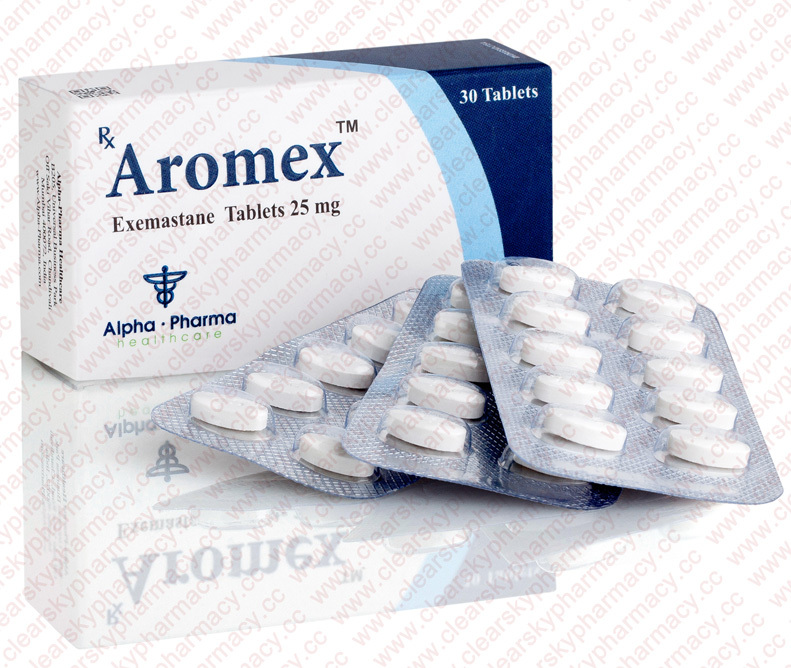 Each Aromex tablet contains 25 mg of Exemestane. The inactive ingredients present in Aromex pills are mannitol, crospovidone, polysorbate 80, hypromellose, colloidal silicon dioxide, microcrystalline cellulose, sodium starch glycolate, magnesium stearate, simethicone, polyethylene glycol 6000, sucrose, magnesium carbonate, titanium dioxide, methylparaben, and polyvinyl alcohol. What are Aromex Tablets Used For? Generic Aromasin 25 mg tablets, manufactured by Alpha Pharma, contain Exemestane which blocks the aromatase enzyme essential for the production of estrogen hormone. Aromex tablets are typically administered as oral therapy for cancer treatment in women who have undergone menopause. Exemestane tablets 25 mg can be used for the treatment of only those tumors which are dependent on the estrogen hormone for their growth and survival. Exemestane tablets reduce the amount of estrogen circulation in the blood and this helps to prevent or reverse the growth of such tumors. Exemestane tablets (Aromex) cannot be administered to women who are of child-bearing age. Treatment with Exemestane tablets is usually recommended in patients in whom chemotherapy with other anti-cancer drugs such as tamoxifen has been unsuccessful. Generic Aromasin tablets also helps to prevent the recurrence of cancer. Aromex 25 mg tablets can be administered for a period of five years. Exemestane tablets (Generic Aromasin tablets) are also taken for the purposes of bodybuilding. Since Exemestane acts an estrogen-inhibitor, professional body builders' use Exemestane tablets towards the end of a steroid cycle to restore the blood levels of testosterone in the body. This regulation of testosterone levels in the body helps to avoid the adverse effects such as gynecomastia that usually occur during the end of a steroid cycle. Aromex Dosage - How to Take Exemestane Tablets? You should use Exemestane tablets exactly as recommended by your doctor. Your doctor may suggest a dosage of Aromex tablets depending on your medical requirement, body weight, other medical conditions, and current medications. Exemestane 25 mg tablets should be taken once a day with a glass of water, after a meal to avoid indigestion problems. Try to maintain a regular schedule for the medication such that you take Generic Aromasin tablets at the same time every day, to get the maximum benefit of the medication. Doctors usually recommend a dosage of a single Exemestane 25 mg tablet once daily after a meal. Your doctor may alter the dosage of Exemestane tablets and dosage period depending on your response to treatment. The treatment with Generic Aromasin 25 mg tablets can be continued for a period of five years. You may need to monitor your health through frequent blood tests during the course of Exemestane 25 mg tablets. Aromex Mechanism of Action - How Does Exemestane Work? Exemestane (Generic Aromasin tablets) acts as an aromatase inhibitor. The enzyme aromatase is responsible for the conversion of androgens (hormones produced by adrenal glands) such as testosterone and androstenedione into estrogens. Certain tumors require estrogen for their growth and survival. Exemestane tablets lower the blood levels of estrogen in the body thus starving the tumors of estrogen. Estrogen deficiency will prevent the growth of estrogen dependent tumors and they will eventually shrink in size. Bodybuilders use Exemestane tablets to minimize the undesirable effects of estrogen that are produced as by-products toward the end of a steroid cycle. By blocking the production of estrogen, bodybuilders' can minimize the risk of side effects of steroid cycle such as gynecomastia. If you miss your regular dose of Exemestane tablets (Generic Aromasin tablets), take it as soon as you remember. You can continue you regular schedule the next day. If you remember the missed Aromex tablets the next day, take your regular dose and skip the missed dose. Do not take a double dose to compensate the missed dose. Store the pack of Exemestane 25 mg tablets (Generic Aromasin tablets) at room temperature (20 - 25°C), protected from heat, moisture, and sunlight. Retain the original packing of the medication and do not consume Exemestane tablets (Aromex) beyond its expiration date printed on the blister pack. Keep the pack of Generic Aromasin tablets away from the reach of children and pets. Do not discard Aromex tablets along with domestic waste or sewage. Consult your doctor or pharmacist about the correct method of disposal. Before beginning the treatment with Exemestane 25 mg tablets (Generic Aromasin tablets), discuss your personal and family medical history with your doctor. Inform your doctor if you have kidney disease, liver disease, high blood fats (cholesterol), bone problems (such as osteopenia, osteoporosis), stroke or blood clots, heart disease (such as chest pain, heart attack, heart failure), high blood pressure. Please inform your doctor if you have an allergy or have had an allergic reaction in the past to Exemestane or any inactive ingredient in Exemestane 25 mg tablets (Generic Aromasin tablets). Before beginning the oral therapy of Exemestane 25 mg tablets, please inform your doctor of all your current medications including prescription drugs, over the counter medications, mineral supplements, herbal products, and vitamins. Aromex is known to drug interactions with estrogens (such as ethinyl estradiol, conjugated estrogens), estrogen blockers (such as anastrozole, tamoxifen), and raloxifene. Certain medications can increase the exclusion of Exemestane from the body, resulting in a decrease in the efficacy of Exemestane. Such drugs include seizures medications (such as carbamazepine, phenobarbital, phenytoin), rifamycins (such as rifabutin), St. John's Wort, among others. The treatment with Generic Aromasin tablets is contraindicated in patients who are allergic to Exemestane or any inactive ingredients present in Generic Aromasin tablets. Generic Aromasin tablets are also contraindicated in women who have not yet undergone menopause and are still of child-bearing age. There are no known interactions of Exemestane with alcohol. Treatment with Exemestane can decrease the bone mineral density. Consult your doctor about the risk of developing osteoporosis before starting the course of Generic Aromasin tablets. Exemestane 25 mg tablets may make you light-headed or impair your vision. Avoid activities such as driving, using machinery, or performing any activity that requires complete vigilance or perfect vision until you are sure about your safety. Aromex 25 mg tablets is a category X medication i.e. the administration of Exemestane tablets in pregnant women has known to cause certain birth defects. The risk of transmission of Exemestane through breast milk is unknown. Pregnant women and lactating mother are usually advised to consult their doctor if they are planning to become pregnant or start breast feeding during the course of Generic Aromasin tablets. If you plan to have surgery or any dental procedure, inform your doctor or dentists about your course of Exemestane tablets (Generic Aromasin tablets). In case of an emergency medical treatment, please inform the practitioner about your course of Exemestane tablets and the details of your last dose. Inform your doctor immediately if you experience any of these side effects. This is not a comprehensive list of all the possible side effects of Aromex tablets (Generic Aromasin tablets). If you develop any other medical conditions during the course of treatment with Exemestane tablets, please consult your doctor immediately. You can buy Aromex 25 mg tablets, manufactured by Alpha Pharma online from Clear Sky Pharmacy. Aromex 25 mg pills are supplied in a box of 30 tablets. The 25 mg tablets costs only $ 0.97 each if you place an order for 600 pills.